Keep old toys new with the Lipper Toy Box. There's a special elated feeling children get when they unearth a toy long-since forgotten, recalling the moment of its first acquisition mixed with a nostalgic sentimentality and pride in their own clever discovery. This large chest has ample room to store all of your child's favorite treasures, keeping them safe and sound until they can be rediscovered for another glorious day of play. 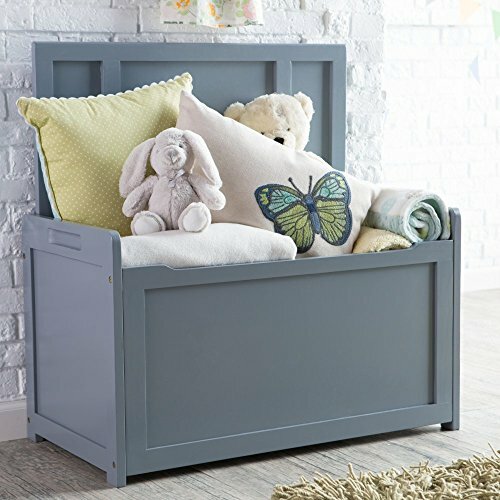 This toy box features a classic design and wood construction with a gray finish that fits sweetly in any child's room. And between treasure hunts, your child will love closing the flip-top lid to play or read up on the top, which doubles as a handy bench. Overall dimensions: 33L x 17.75W x 24.24H in.. Solid wood construction. Sweet gray painted finish. Safety hinge and finger slots for added safety. Doubles as bench when closed. Air holes prevent mold or mildew. Designed for children 3 and up.